Think Hinjewadi is all about tall buildings, I.T. crowd and slow traffic? We beg to differ. While most of you may not associate the area with fun things, Team LBB brings you a list of 6 cool restaurants and lounges that’ll make you see Hinjewadi in a different light. Read on! Best for live music, chill vibe and great food, The FML Lounge near Hotel Fortune Inn Exotica is perhaps one of the stunning looking bars in Hinjewadi. Charming al fresco setting amidst green leafy plants, wooden tables, saddle stools and low-hanging lights – FML is perfect for date nights. Food-wise, we absolutely love their Balinese chicken satay, burnt chilly paneer and the scrumptious bacon cheese burger. For cocktails, must-try the classic black Russian made of vodka and cream. 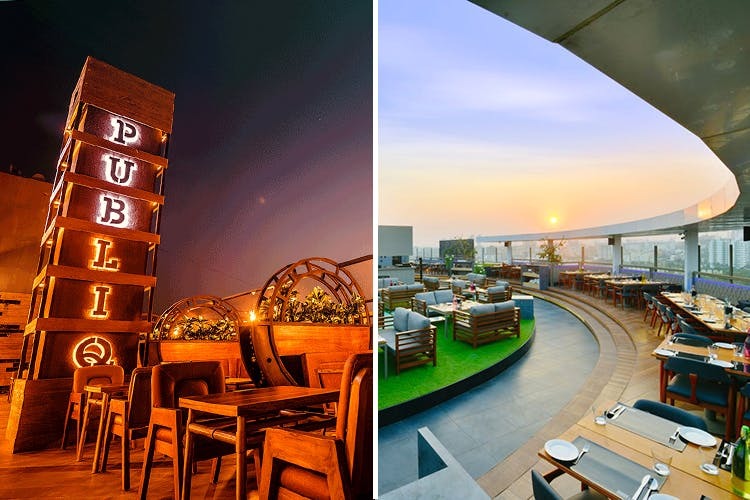 Located on the 9th floor of White Square building at Hinjewadi, Publiq is a gorgeous rooftop bar that overlooks the Mumbai-Pune Highway. The place is classy and fun at the same time; think wooden interiors lit with Edison and radio bulbs, old-school bar, a retro DJ console table and big brown couches. They also have a dance floor for those that don’t believe in sitting through a party. Coming to the food, we would highly recommend the Publiq chakhana, the butter chilly wings, the Amritsari fish and chips, and the Tandoori stuffed mushrooms. If you’re looking for some authentic Nawabi biryani with Hyderabadi-style paya nihari and mutton dalcha, must visit Ancient Hyderabad in Xion Mall, Hinjewadi. The restaurant, in every definition, is a meat-lover’s haven. From flavorsome gosht mutton biryani to tangdi kebabs and kali mirchi prawns, they’ve got it all. In fact, head to Ancient Hyderabad for a delightful Ramzan spread till June 15 and dig in to mouthwatering haleem made in ghee, dalcha and more. Known for its lip-smacking barbecues & scrumptious buffet meals, the Hyderabad-based Absolute Barbecues, located opposite Atlanta Complex, is India’s first ever wish grill restaurant. What does that mean? In few words, you can make your own grill and eat it too! Vegetarians, you can choose from olives, zucchini, tofu, baby corn and mushroom. Meat lovers, take your pick from cultured bunny, octopus, emu, squid, duck and quail. Next, ask for your favourite sauce – chilli garlic tango, tufani Indian chaap masala, sambal olek or lemon curry sauce. Heat your meat/veggie on the grills attached to your dinner table and savour the dish to your heart’s content. Rustic brown ambience, bricked walls, skyline views and a ceiling full of radio lights, Thikana at White Square in Hinjewadi is our kind of party place with awesome music and live sport screening. Lifting the moods higher, this place serves the meanest cocktails in town; from beerita (beer + margarita) to kamikaze and Thikana shandy, which is a concoction of lemonade and beer with fresh fruits. Complimenting the drinks is their extensively funky food menu. Our favourites include Thai fish cake, sharabi phuchka (panipuri served with flavoured tequila) and poached pears with papaya sauce. With a huge 270 degree curvature overlooking the city skyline, the interiors of this restaurant in Hinjewadi replicates the gorgeous Marine Drive in Mumbai. While the ambience is an instant winner out here, Marine Drive also does a pretty good job when it comes to food and drinks. We recommend you try their beer-battered fish fingers with a glass of paan crista, made of whiskey, sweet sour, paan syrup and butterscotch ice cream.